After tripping over it on my floor for months, I finally buckled down and finished the Star Gazing quilt top. 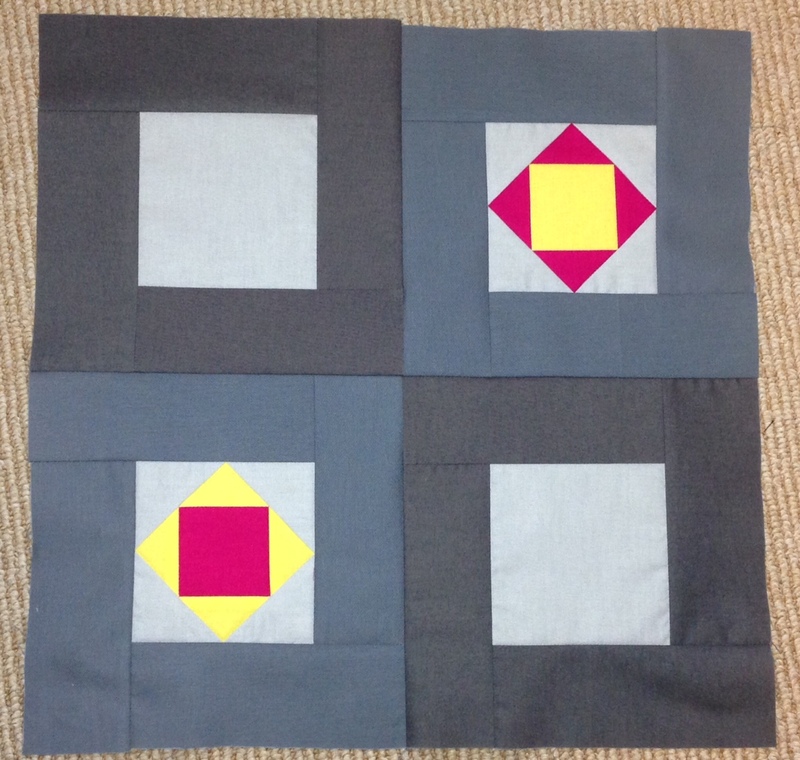 I finished Block 11 which included paper piecing for the yellow square corners. When I was designing the coloring on this block, I could not settle on a color arrangement that I loved. I redid the coloring on at least 4 different occasions before deciding on this one. Every other block I was able to settle on pretty quick, but there was something about this one. I am liking how it came together. I think the yellow, pink, and blue all give it a nice pop while not being too obnoxious. I also finished all of my partial seams and assembled the top. I may add a 2″ border of the darkest border and bind in the same but I haven’t decided yet. But this counts as being finished. 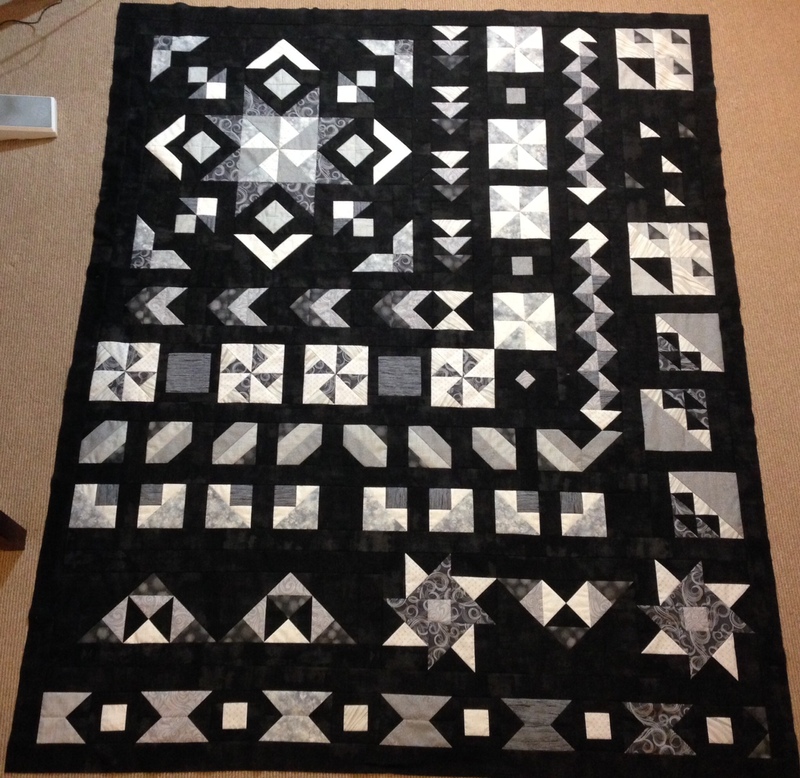 My goal was to have the top of the quilt be lighter and for the blocks to get darker towards the bottom. I’m happy with how that came out and that it’s subtle but still there. 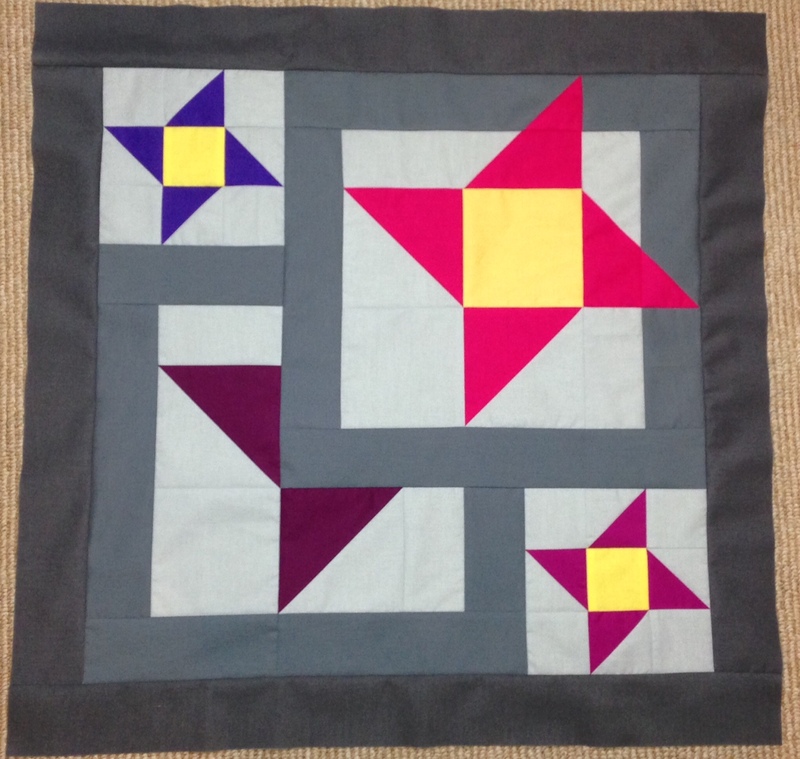 This Block of the Month is being run through Quilter’s Market in Tucson, starting next month. Swan will also be sending it to quilt shops throughout the country. Hoffman fabrics is also promoting the BOM, since Swan made a version using their batik-solids line. Welp… it’s been awhile. In my real life I’m an office manager for a small software company. The last few months have been a bit crazy with the company (in a good way) so that plus summer activities have been eating up my time. I’m also participating in a a swap on SpriteStitch and starting to work on my gifts. However, we can’t post pictures of anything until after our recipient receives it, to avoid spoilers. I’ve made a little progress on Star Gazing. 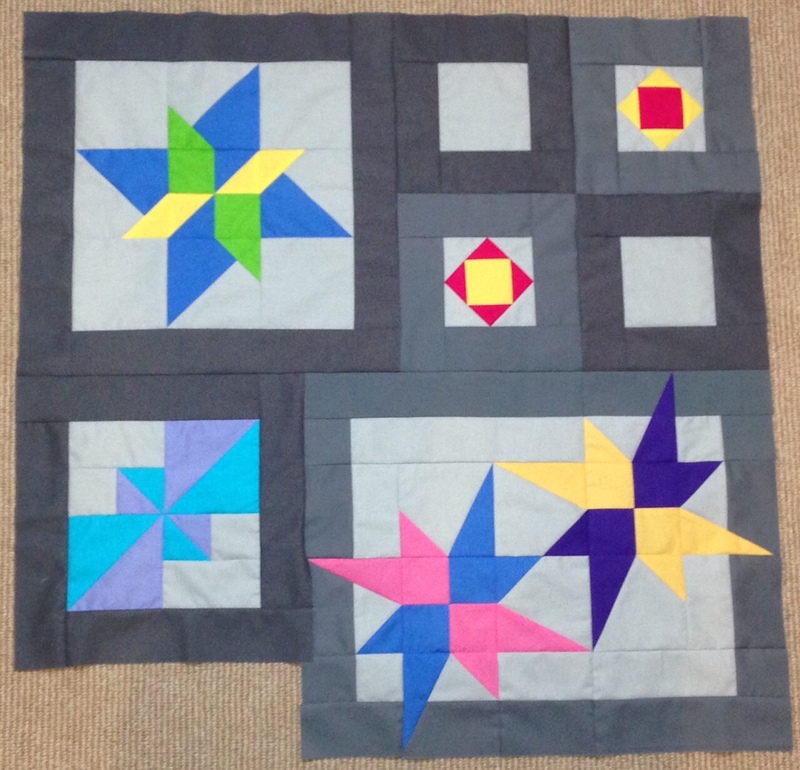 I finished block 6 (in the group shop, 6 is Binary Stars, in the bottom right). I also started to assemble the top. These are blocks 1, 2, 5, and 6. Attaching the blocks is almost entirely partially seams, so it’s a little slow going. 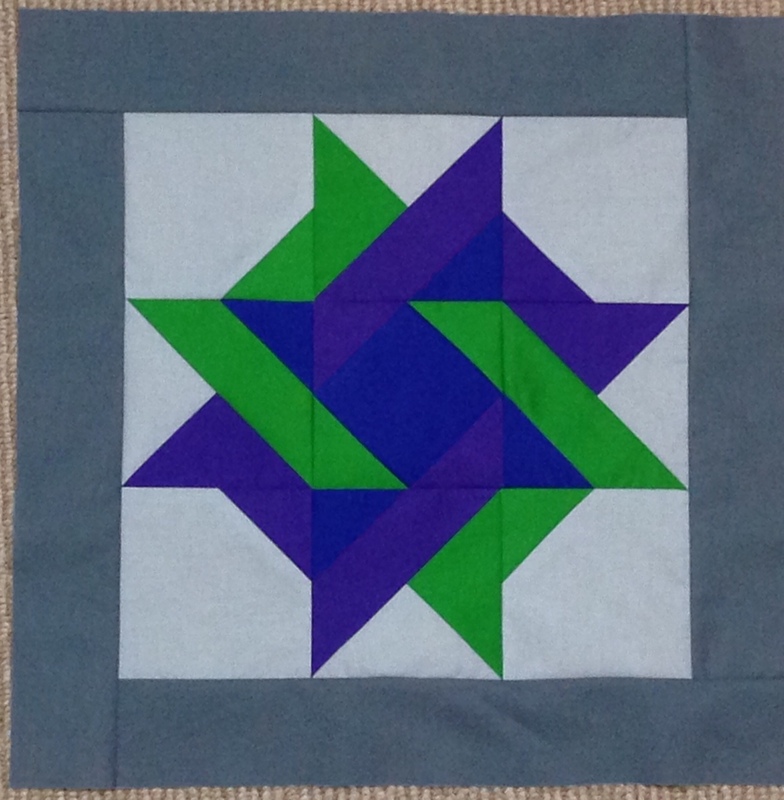 Block 6 was paper pieced. 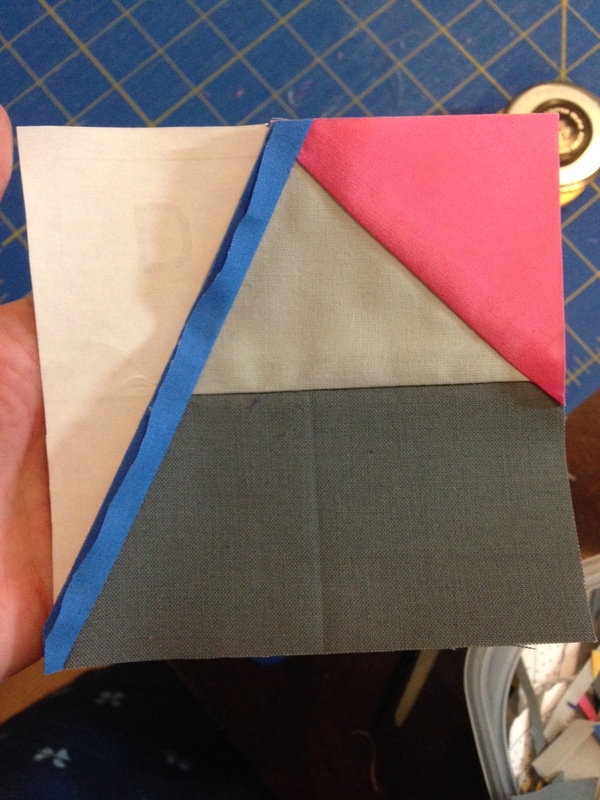 Protip: When doing paper piecing, when you trim your fabric, move the fabric that you want to keep out of the way so you don’t cut through it. I also constructed blocks 8 (Regulus) and 9 (Southern Star). I have 2 blocks left (for those of you counting, block 7 is complete. It just didn’t get its photo taken) and then some assembly work. I am starting to see the light at the end of the tunnel for Star Gazing. I’ve had a little bit of time to work on this and have Blocks 5 and 12 finished. Block 5 is the blue and purple pinwheel on the right. I had an hour at home between work and trivia and I told my trivia team that I needed to show them proof of a block completion to play. It only took me about 30 minutes and was just nice to make some progress. 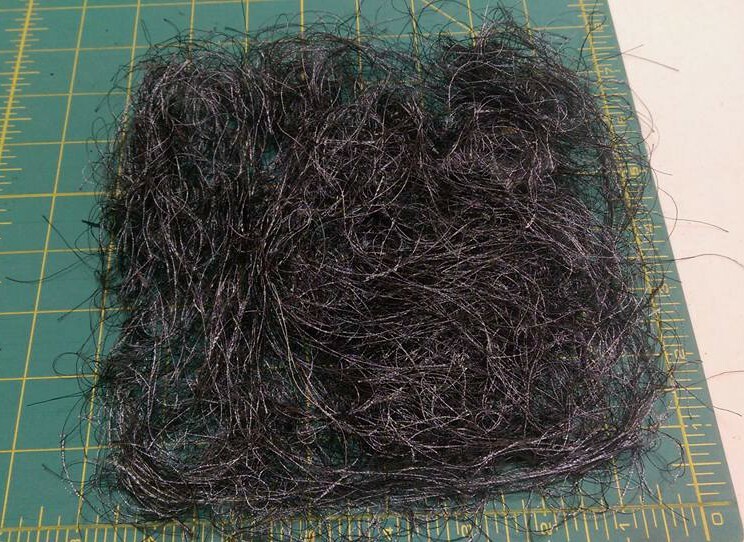 When you first start sewing, what can happen is that the machine can grab the thread and give you a bird’s nest mess of thread. To avoid this, you can use scraps as starters/enders. You sew what you’re sewing and then rather than cutting it off the machine and being finished, you send through a scrap and leave it on the machine until you’re ready to sew again. Then when you start, you just sew and there are no new threads being started which means, no bird’s nest. 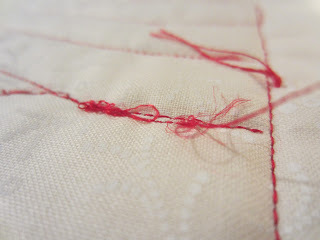 What I try to do, since I want to minimize wasted thread (especially when it’s Aurifil… that is expensive!) is to sew multiple blocks at once. For Block 12, it’s a very simple block. I just keep its pieces next to my machine and when I need an ender, I grab two pieces and sew them together. I’ve been working on Block 12 in this way since I started and got it finished last night, with Block 5. Wow, it’s been awhile since I’ve posted. It’s been a busy few weeks! Seattle gets so excited for summer that every evening/weekend has multiple events going on, so I’ve barely been home. I also spent a few days in Tucson 2 weekends ago, so it’s been a little crazy. However, this past weekend, I did force myself to stay home for a little bit and sew. This is Block 4 of Star Gazing. It’s a big block – 24″. What’s cool about it is that it’s all made with regular piecing, no paper piecing. Every time that I thought about needing to make it, I kept thinking it was one of the 2 PP blocks. Though Block 5, which is next, is one of the PP ones. PP isn’t my favorite activity in the world. At all. While in Tucson, I met with Swan to discuss some Bella Girl business. We’re planning to release this pattern to quilt shops in the next month or so. I also saw the versions that she and Kathie have made (sorry, no pictures yet, but the quilts do exist). 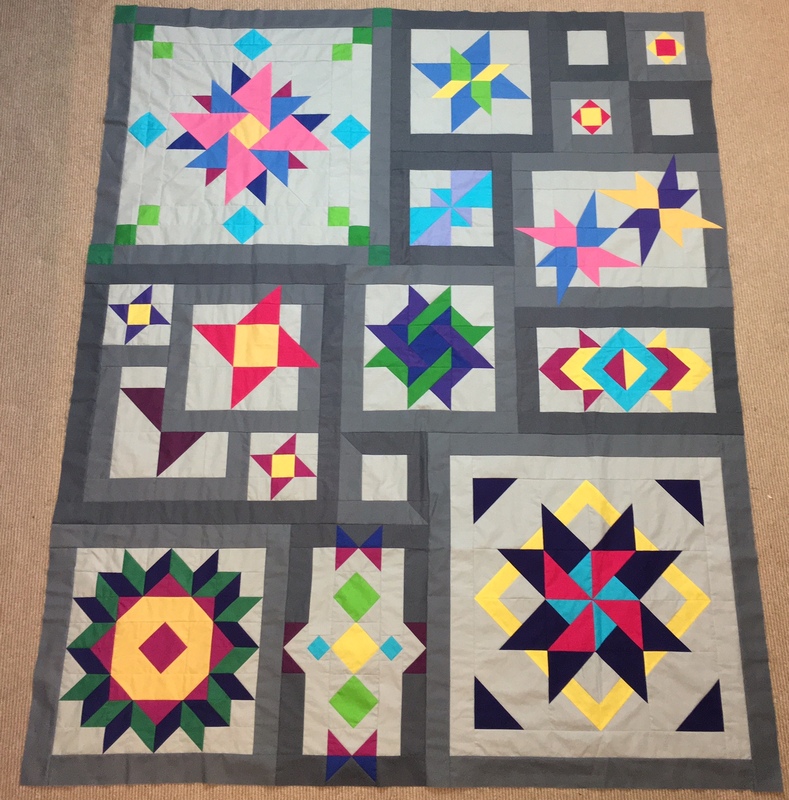 We also tentatively decided that we are going to launch our Quilt-Along in January 2016 using Star in the West/10 Shades. There will be more information on that as we get closer to the end of the year, but look out for that. I promise less time between my next update! 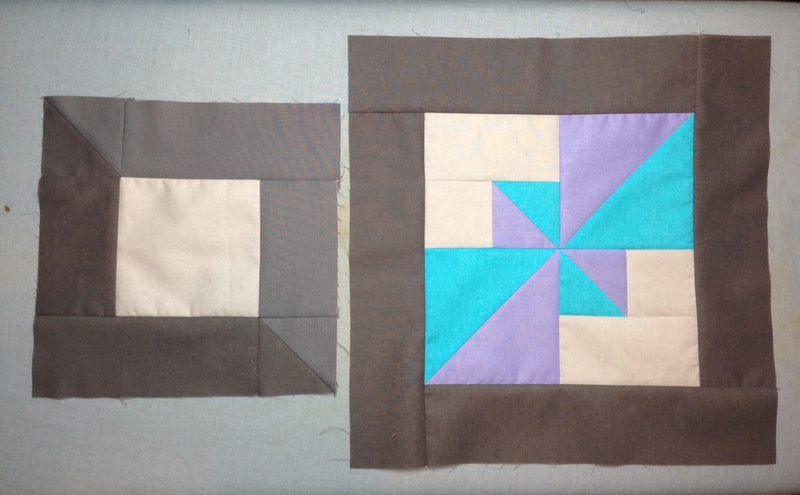 I have had these two blocks cut out, partially sewn, and sitting on my table for over a week and a half now. Last night I finally buckled down and finished putting them together. These are blocks 2 and 3 of The Bella Girls’ Stargazing BOM. This is my color revision in the American Brand Solids fabrics. This gives me a good opportunity to read through the pattern and make sure everything, especially the diagrams, make sense. Meanwhile, Kathie is doing another round of pattern testing, as we move into the final stages of prep to get this BOM ready for sale! 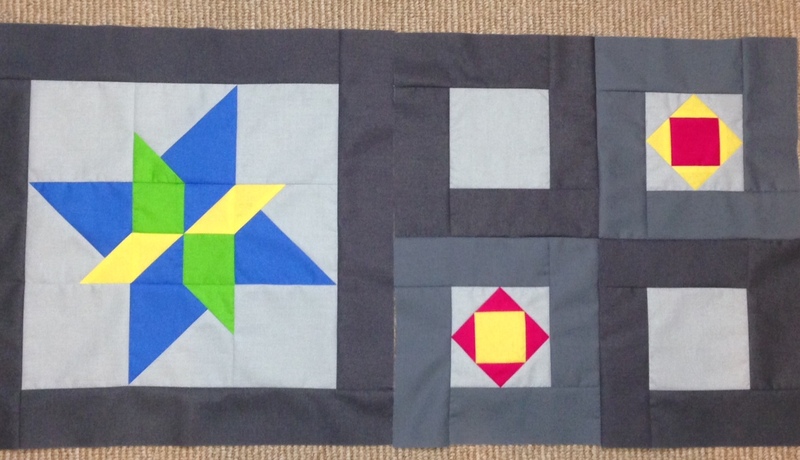 In the quilt, Rigel will be attached to Gemini (Block 1), so here they are laid out. 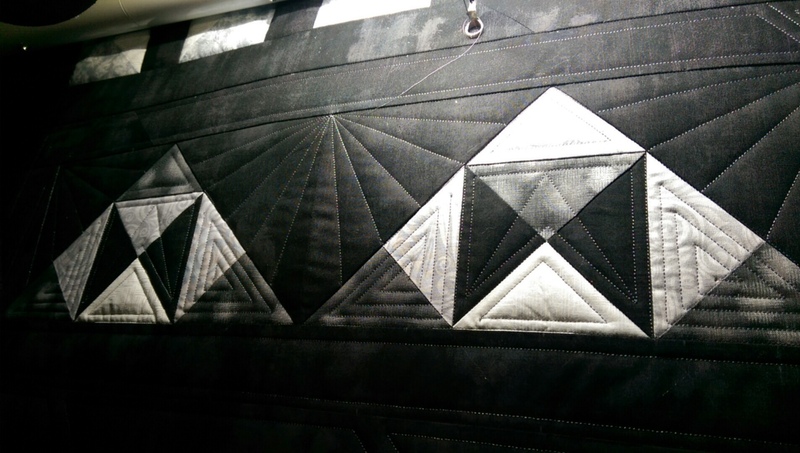 This is also one of the few complete seams in the quilt assembly, since most of the seams are partial seams. My plan is to assemble as I work, when I can. The next block to attach is month 5 or 6, so there will be a slight delay. And Block 3, Summer Triangle. In the original pattern (and what’s being released), there isn’t the covered star, but I wanted to add it in. 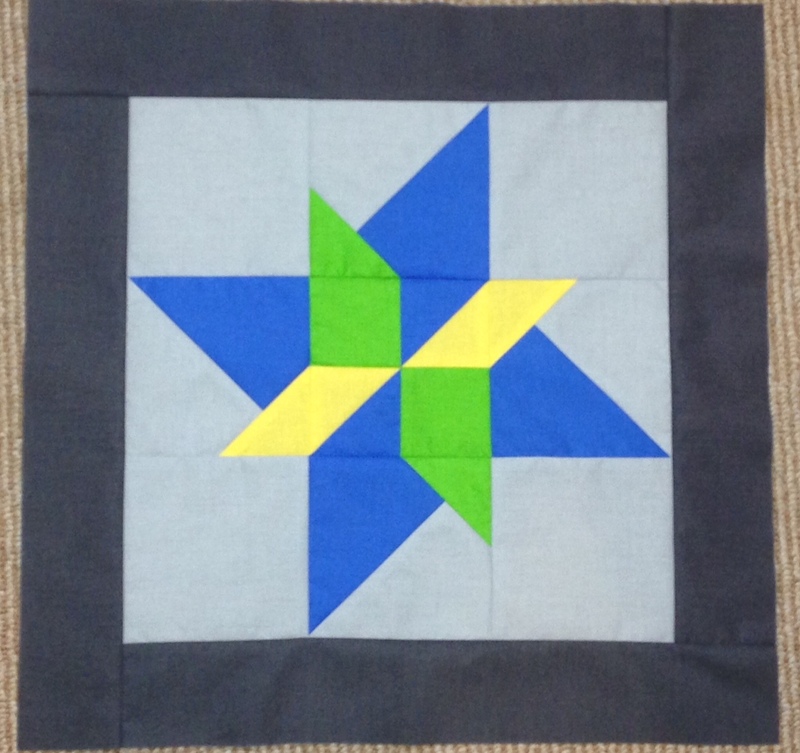 For Swan’s quilt, Nancy quilted a star there, which looks pretty cool. 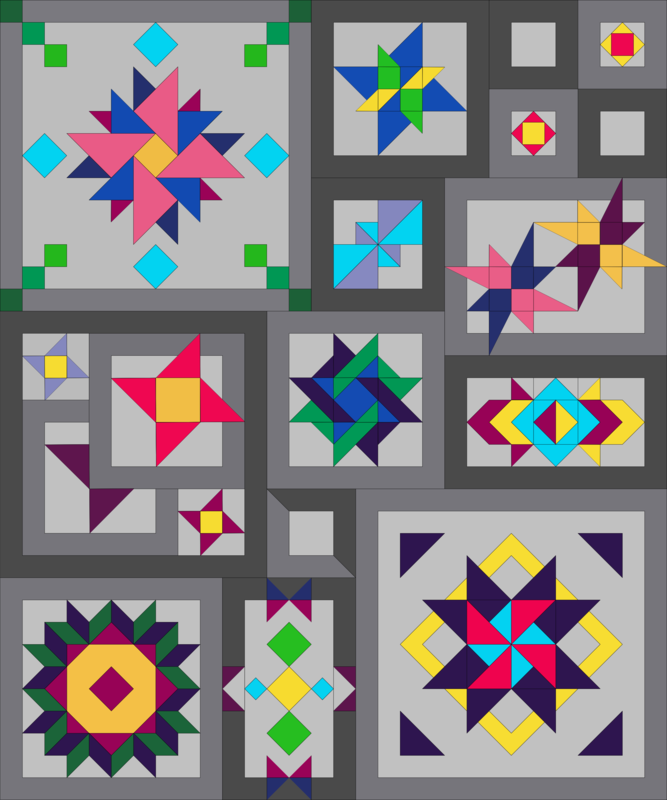 I was thinking that I might want a square-in-a-square quilted into the blank spaces in the Gemini block above. I’m heading to Tucson next weekend. One of the things that I’m doing is picking up the quilted 10 Shades. I’ve seen one preview picture, a picture of the waste thread, and that’s it. When I gave it to Nancy Stein, I asked for black, white, and/or grey thread and, beyond that, gave her free range. She said that she saw a lot of straight lines. Both she and Swan said it looks amazing. One week until I get to see it and bring it home! I have been doing a lot of behind the scenes work for Star Gazing. We (Swan of Swan Amity Studios, Kathie Miller of “I’m afraid of computers”, and I) had come up with the first pattern draft about a month ago. The plan was that over the next 5 or so months, we’d create a solid alternate colorway based on the solid one that I am planning to make using the American Made Brand solids. Well, Hoffman fabrics contacted Swan and asked for a Solid version NOW, so we’ve been putting that together. Kathie and Swan are working on the actual quilt top and I’ve been redoing the pattern with the new numbers. There has been a bit of scrambling, but it’s been fun! It has also been a good way for us to edit the first draft of the pattern. 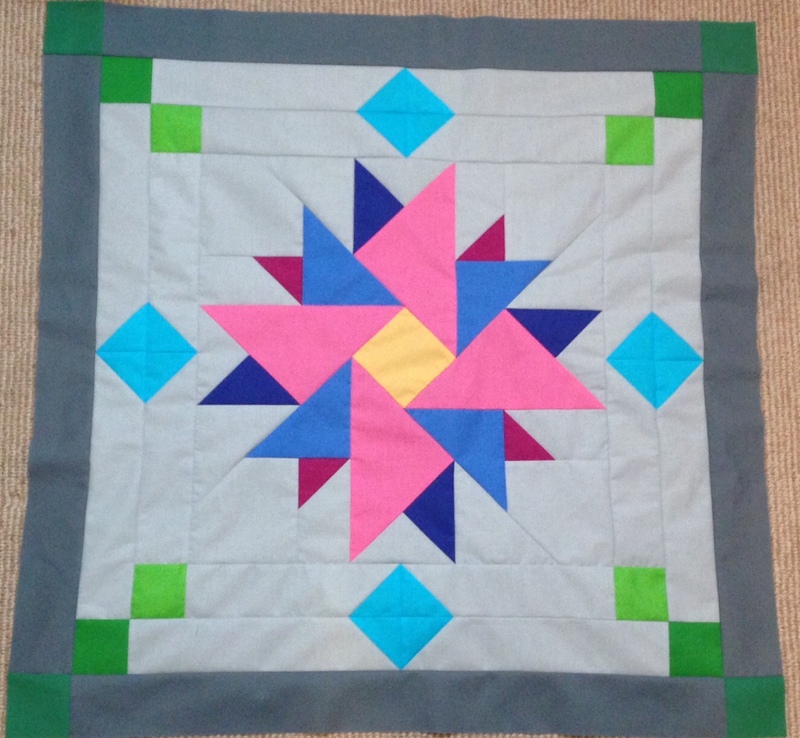 Right now, the plan is for Star Gazing to be sold to quilt shops and through Swan’s website as a Block of the Month. 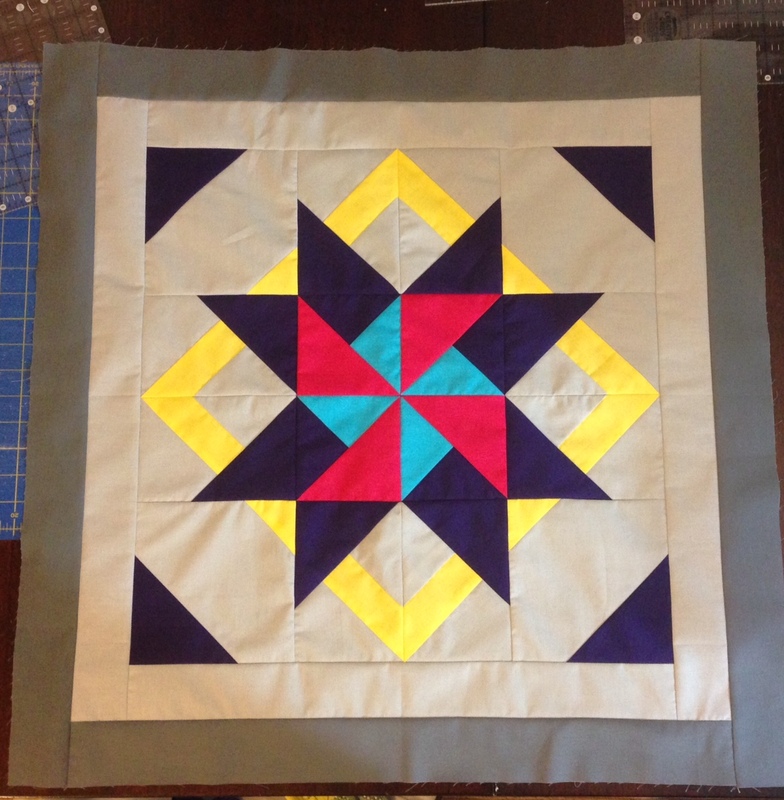 Then for next year-ish, I’m pushing to run it as a Quilt-Along on here. Also, we decided on an official name for the group of us when we pattern together: The Bella Girls. We worked together at Bella Quiltworks in Tucson before it closed and started designing for the shop specifically, so it seemed appropriate. The above is my current version of Star Gazing. I’ve changed a couple blocks numerous times from the last time that I posted a draft, but I think I finally have a version I love. Last night, I started on the first block. Here is my block #1, Gemini.